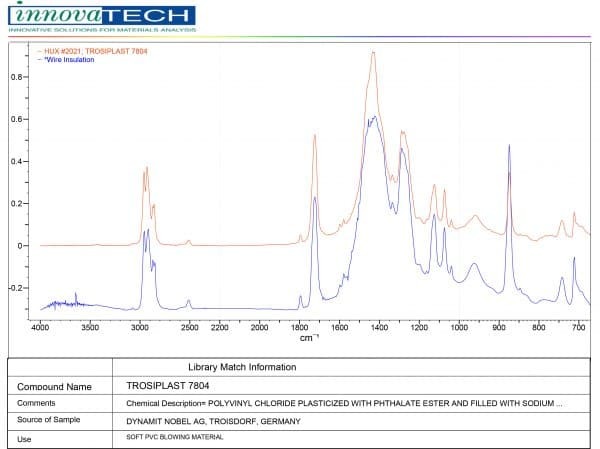 Fourier Transform Infrared Spectroscopy—FTIR analysis or FTIR testing for short—is one of the most in-demand (and useful) materials analysis services Innovatech Labs offers. By measuring a sample’s absorption of infrared light at various wavelengths, FTIR analysis is able to pinpoint the molecular composition and structure of a sample, making it an incredibly useful quality control and troubleshooting tool for manufacturers that need help identifying unknown materials, additives, contaminants, and other material mysteries. Dive into the tabs below to learn more about what FTIR is and how it can be used across an array of industries, the pros and cons of FTIR testing, and Innovatech Labs’ FTIR spectroscopy analysis process, testing capabilities, and sample requirements. Innovatech Labs has provided fast, accurate, and affordable FTIR testing services since 1990—and our team of experienced analytical scientists has more than 100 years of combined experience. Simply put, FTIR testing is an analytical testing technique used to identify organic and some inorganic materials through the application of infrared radiation (IR). Identify unknown materials in solid, liquid or gaseous form. Identify, and in some cases quantify, a surface contamination that’s present on a material. Identify additives in a polymer; some need to be chemically removed (e. g. solvent extraction). As the sample absorbs infrared light, the absorbance of energy is measured at the various wavelengths to identify the sample material’s molecular make up and structure. The patterns of absorption bands at the various wavelengths throughout the infrared region—which is most often referred to as the FTIR spectrum—are unique to each material. Once the spectrum is produced, our analysts digitally cross-reference results using established reference libraries and databases to help identify the material in question. </The applications of FTIR testing span a wide range of industries. 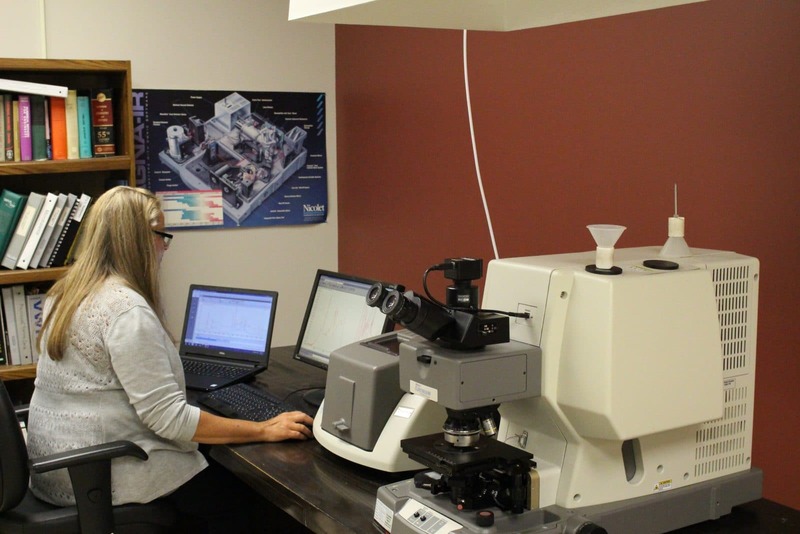 Most often, manufacturers engage our FTIR lab to help identify any particles, residues, films, and fibers that can affect product quality, safety, or function. In addition, FTIR spectroscopy can also be a useful research and development tool to help manufacturers create or choose the best components for a product. Is FTIR a good match for your needs? Contact Innovatech Labs today. The quality of a plastic product depends on the quality of the polymers used during the manufacturing process. FTIR analysis can be a useful tool to identify additives in a polymer, especially when they can be chemically removed (e.g. solvent extraction). FTIR can also identify surface contamination on a sample. FTIR is a particularly precise tool for identifying unknown material and enhancing quality control, making FTIR analysis an incredibly useful tool for a range of manufacturers. For instance, FTIR can help identify and, in some cases quantify, potentially harmful chemicals and contaminants on products such as electronics, toys, medical devices, and food service items. Example 1: The packaging materials used today have many different layers and FTIR can be used to identify the various layers in a packaging material. This can be beneficial for identifying the chemical makeup of a material or identify contaminants contributing to a quality issue, as well as a competitive research tool. Example 2: A company needed to ensure that a recent shipment of beach balls was free of polyvinyl chloride (PVC) and phthalates before sending them off to be sold. FTIR analysis determined that the beach balls did in fact contain PVC, which allowed the company to avoid a product recall. See more examples of FTIR analysis at work in the manufacturing industry. Accurate identification of compounds. 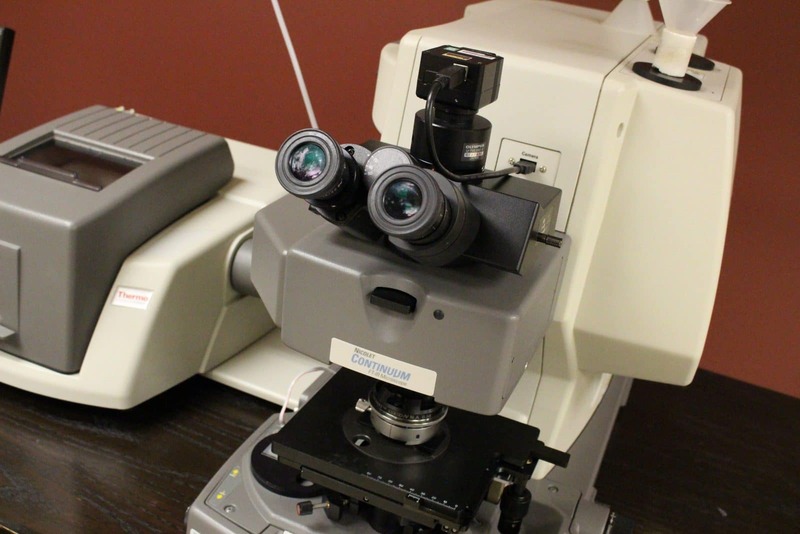 In fact, samples as small as 10-20 microns can be supplied for FTIR analysis using the microscope attachment, allowing for identification of sample particles, residues, films, or fibers. Analysis with little or no harm to the sample. Sample information is collected accurately and at high speed, enabling our team of analytical scientists to turn expedited requests around in as little as 24-48 hours. FTIR is a bulk analysis method; small amounts of one material mixed in with a larger amount of another may not be seen and combinations of unknowns can be difficult to identify. These limitations can be overcome by using chemical extractions and/or spectral subtractions to isolate the smaller constituents or individual components of a mixture. Sample size: Samples can range in size, with the smallest being as small as 10-20 microns. Sample type and compatibility: Vacuum compatibility is not an issue and samples may be in liquid, solid, or gaseous form. 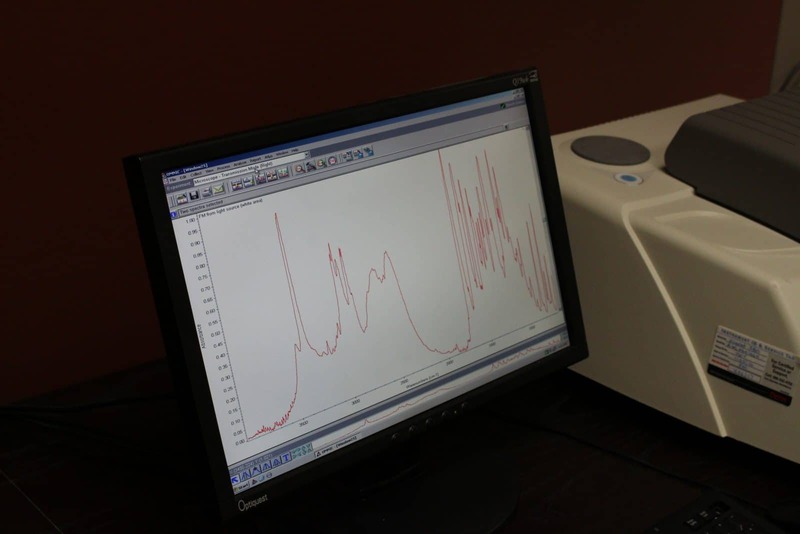 Unique capabilities: Innovatech Labs can use several different FTIR sampling techniques, which is determined by the type of sample. For example, thin organic films on a reflective surface (e.g. gold) can be analyzed using the reflectance mode of the microscope. As another example, the outer 1-10 microns of a material can be analyzed using attenuated total reflectance (ATR) spectroscopy. Timing: The typical analysis time is ½ hour per sample, but preparation times for quantification may take longer. Standard turnaround time for results if five business days; expedited turnaround time is just 24-48 hours. Every project is unique, so we invite you to contact one of our highly skilled analysts to discuss your specific needs. Contact us today by email or phone 888-740-5227.